Imperial Metals president Brian Kynoch, spoke these words at a news conference on August 5, 2014, the day after the devastating collapse of a tailings dam at one of Imperial’s operations, the Mount Polley copper and gold mine. More than 24 million cubic meters of water filled with metals-laden mining waste, or tailings, spilled into Polley Lake, down Hazeltine Creek and into Quesnel Lake — an important source of drinking water and spawning territory for one quarter of BC’s sockeye salmon. Investigations into the disaster have revealed that Imperial Metals should have known that a breach was likely. 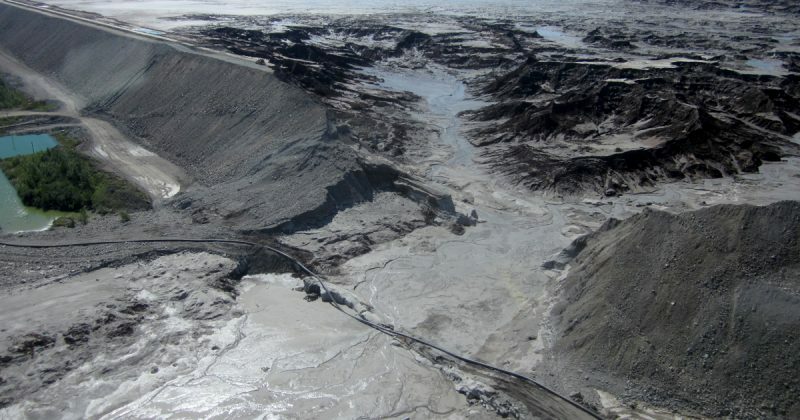 A 2010 inspection report uncovered by Vancouver Sun reporter Gordon Hoekstra had identified concerns about the integrity of the tailings storage facility including a large crack in the perimeter wall and broken instruments for measuring water pressure. The company had received warnings that the amount of effluent held back by the dam exceeded authorized levels, despite nine increases to the dam’s embankment height since its construction in 1997. Workers employed at the Mount Polley Mine had expressed concerns about dam safety to management — and even to the BC Ministry of Energy and Mines — but these were ignored. How could this have happened in a place like British Columbia, Canada, understood by its citizens and seen by others as a “developed” country, a beacon of stability and democracy? When the Fundão tailings dam collapsed one year later in Mariana, Brazil, it seemed more believable that a South American country would have the kind of lax regulation that could lead to a disastrous spill. Brazil, after all, is located in the Global South, often portrayed as “developing,” endemically corrupt and politically unstable. A closer look at the mining disasters in Mount Polley and Mariana, however, reveals remarkable similarities in the circumstances leading to both breaches, as well as in the responses afterward by mining companies, governments and civil society. In both cases, the mining companies enjoyed close relationships with political parties and government officials, making significant financial contributions to major parties, lobbying intensively and advancing narratives blurring the distinction between mining industry interests and what is genuinely in the public interest. Those narratives centre on the idea that mining investments bring economic growth and job creation (with no consideration of mining’s environmental and community impacts, nor any reference to issues of Indigenous rights). The mining discourse regularly denigrates regulatory measures as needless red tape lain by inefficient government bureaucrats. Yet had robust compliance and enforcement mechanisms been in place, experts suggest that both dam breaches could well have been prevented. As The Tyee reported, mine inspections in BC had been reduced by nearly half since 1991. Further, only one year after the disaster, with investigations still underway, then-BC Premier Christy Clark announced new support for mining including $6 million to reduce permit turnaround times. A change in government in May 2017 raised expectations of major changes. The new government has taken important steps, including committing to implementation of the UN Declaration on the Rights of Indigenous Peoples, banning corporate and union political donations, and undertaking a review of BC’s controversial “professional reliance” model. There has been silence, however, on the Auditor’s central recommendation: to address the “irreconcilable conflict” of having one government ministry tasked with both promoting and regulating mining. In the meantime, mining company practices have not been substantially overhauled. The Mount Polley Mine resumed operations in June 2016. To date no one has faced fines or punitive measures. The more one analyzes the tailings dam disasters at Mount Polley and Mariana, the clearer it becomes that these breaches were not one-off events but point to systemic issues. If regulatory capture continues and extractive industries fail to make major changes to how they operate, more catastrophic tailings dam failures will surely take place. Judith Marshall is a Canadian popular educator and writer. She worked for eight years in the Ministry of Education in post-independence Mozambique, designing curricula for workplace literacy campaigns. On her return to Canada, she completed a PhD at the University of Toronto with a thesis—and later book—on literacy, power and democracy. She has recently retired after two decades in the Global Affairs department of the United Steelworkers, which included member education on global issues and the organization of many international exchanges of workers, especially in the mining sector. She is now an Associate of the Centre for Research on Latin America and the Caribbean at York University in Toronto.